Hugh L. Carey served seven terms in the U.S. House of Representatives before taking office in 1974 as the 51st Governor of New York. He was re-elected in 1978 and is the architect of the financial plan that saved New York City from bankruptcy. ALBANY, N.Y. (August 12, 2009) -- The University at Albany Foundation has named former New York State Governor Hugh L. Carey as the recipient of its Citizen Laureate Award. The former governor will be honored on the 30th anniversary of the award, October 22, 6 p.m., at the Hall of Springs in Saratoga Springs, N.Y. The Citizen Laureate Award recognizes outstanding leaders in business and industry, government and academia, and is the most prestigious honor bestowed by The University at Albany Foundation. This year�s event, which marks the award's 30th anniversary, will feature a celebration of the "transformational leadership" that has shaped the Capital Region since the award�s inception, and pay tribute to the 68 past Community and Academic laureates. "The University is very pleased to honor Gov. Hugh Carey's leadership, integrity and extraordinary service to his state and country," said University at Albany President George M. Philip. "In our history of distinguished honorees for this very special award, few have risen to the level of icon," said University at Albany Foundation President George Hearst. "Hugh Carey is one of them. He is a steady constant in the lives of all New Yorkers, a reminder that greatness is not granted, but earned." 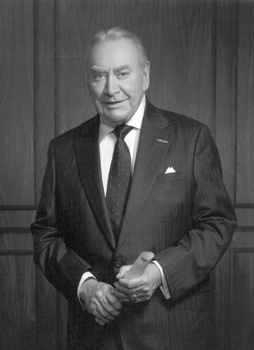 Hugh L. Carey was elected the 51st Governor of New York in 1974, and re-elected in 1978. Carey, the architect of the financial plan that prevented the bankruptcy of New York City, also began a sweeping program of fiscal reform and economic development to restore the state�s vitality. His extensive $2.5 billion-plus tax-reduction program was key to restoring New York�s competitive economy in the 1970s. One of his earliest acts as governor was signing the historic Willowbrook Consent Decree, committing New York State to sweeping reforms in the care of the developmentally disabled. Carey also dealt with such controversial problems as Love Canal and the pollution of the Hudson River. He instituted the "I Love New York" program and founded the Empire State Games. Carey became a nationally recognized spokesman for regional concerns, and a proponent of comprehensive programs for urban and industrial revitalization. He founded the Conference of Northeast Governors (CONEG). Carey serves on the corporate board of Triarc Companies. He is a member of the North American Board of the Smurfit Graduate School of Business, UCD, where a chair in Organizational Behavior has been established in his name. The honorary chairman of the Paul Robert Carey Foundation, Carey is also a trustee of the Flax Trust, which works to promote economic development and reconciliation in Northern Ireland. He has been honored by numerous nonprofit organizations, including the New York City Landmarks Conservancy, Saint John�s University and the New York State Council on the Disabled, and is a frequent honoree and guest speaker for religious, educational, health, government and social service institutions. Carey attended St. Augustine�s School in Park Slope, N.Y., and graduated from St. John�s University and St. John�s University Law School with the degree of Juris Doctor. He served with the New York National Guard; received the Combat Infantryman Badge, the Bronze Star and the Croix de Guerre; and left active duty with the rank of colonel. Carey was elected to the U.S. House of Representatives from the 12th Congressional District in Brooklyn in 1960, returning for six more terms from the 15th Congressional District. after district lines were redrawn. Funds raised through the event will support educational, research and public service initiatives set by the University and managed by The University at Albany Foundation. Established in 1967 to encourage philanthropic support, the Foundation promotes the University's strategic goals by leading UAlbany's fundraising, asset management and stewardship activities. Governor Carey will be honored at a black-tie dinner on Thursday, October 22, 2009 at the Hall of Springs in Saratoga Springs, N.Y. A reception at 6 p.m. will be followed by dinner and an award program at 7 p.m. Individuals and organizations who wish to attend the event or participate through sponsorship opportunities, contact Terri Scalise Roller at (518) 437-5095. Educationally and culturally, the University at Albany-SUNY puts "The World Within Reach" for its 18,000 students. An internationally recognized research university with 58 undergraduate majors and 128 graduate degree programs, UAlbany is a leader among all New York State colleges and universities in such diverse fields as public policy, nanotechnology and criminal justice. With a curriculum enhanced by 300 study-abroad opportunities, UAlbany launches great careers. For more information about this globally ranked University, visit www.albany.edu. For UAlbany's extensive roster of faculty experts, visit www.albany.edu/news/experts.shtml. 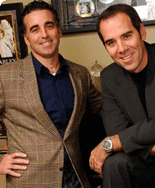 For UAlbany alumni Monte and Avery Lipman, music is more than just a hobby. It's a passion.